When you first purchased your car you likely enjoyed how smooth the ride was. You could cruise down the road without effort and taking corners was more of a thrill than a chore. However, after many miles, it is likely that the steering has loosened up a bit, to put it casually. The power steering system in your car requires routine maintenance. If it is not completed, or due to general wear and tear, you may encounter some of the following problems if it is time for steering repair. A vibrating steering wheel could indicate that the power steering pump is having issues, but this may actually (and quite commonly) be related to a wheel alignment problem. If the alignment is off it could result in your vehicle trying to go in two directions at once, causing the steering wheel to pull back and forth. There are several things that can cause a car to drift to one side or the other. Your vehicle may veer to one side due to failed suspension or something as simple as having insufficient air inside one of the tires. However, a worn steering system could prevent your car from wanting to go straight down the road as well. 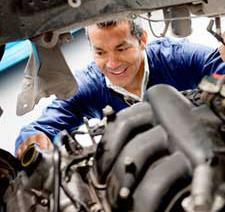 Give your local auto repair shop a call to schedule proper diagnostics to find out exactly what is happening. Is it hard to turn your steering wheel, particularly at low speeds? This may be a sign of a failed power steering pump. The power steering system is what makes it simple to navigate at low speeds. If you grew up prior to the 1990s you likely remember having to use some muscle to get your vehicle around a bend, you shouldn't have to do that today! Does your car's steering wheel seem to bounce around, back and forth, left to right, but the vehicle doesn't change direction? Play in the steering wheel can make it hard to properly control your car so be sure to have this issue checked out as soon as it begins to occur. If you believe your vehicle is suffering from some sort of steering issue be sure to have it checked out right away. For superior steering repair in Covina for any make or model head to Hye Tech Auto. We offer high quality auto repair and maintenance for foreign and domestic cars, trucks and SUVs using the latest diagnostic and service technology. To schedule an appointment for professional auto repair in Covina give Hye Tech Auto a call at (626) 332-5452!